Rusti Steel & the Startone are a rockabilly country boogie band featuring guitar, bass, drums, pumpin’ piano and occasionnal steel guitar. Rusti is not really a newcomer having released rockin’ albums since the mid 80’s. And though it sounds a bit cliche, I have to say that Gone With The Wind is by far his best. With 15 songs and only one cover it’s a killer. It opens with the Bill Haley & the Saddlemen sound of the title track: propulsive beat on the bass and drums, powerful piano and agressive steel guitar. Next is Missin’ You Blues that owes more to Elvis circa 1956, with Alan Wilson providing back up vocals for a full Jordanaires effect. Double bass player Stewart Dale wrote the Burnette inspired Can’t Go Out, a perfect number though I waited until the end, hoping to hear at least of them scream. The country boogie of Hopin’ For The Best is the good occasion to put the piano to the front. But no time to loose and back to good ol’ rockabilly ala Baby Let’s Play House with Baby You Doin’ Me Wrong followed by the sole cover of the album: Clyde McPhatter’s Lover’s Question.Lucky Guy is a piano led rockabilly with a Danny Cedrone solo in the middle. Speed Crazy Baby is halway between Just Because and Maybellene. Stewart Dale sings Slow Down suzie his second contribution to the album and a good rocker. After a couple more rockabilly numbers the album closes on a high note with I Can’t Hide, a mean rockin’ numbers ala Gene Maltais’Raging Sea.It’s a western Star release so expect top notch production and recording work and special mention to Chris Wilkinson (Bonneville Barons) for the superbly designed cover and booklet. 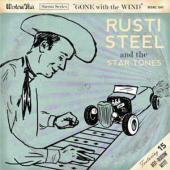 Share the post "Rusti Steel"